Thousands of musicians, artists and dancers from Pacific Rim countries will take part in the weekend-long Pan-Pacific Festival. Regular folk can participate in a marathon Sunday morning. Drums, dance pageantry and parades are all components of this weekend's 27th annual Pan-Pacific Festival -- Matsuri in Hawaii. Thousands of musicians, artists and dancers from Pacific Rim countries will stage a weekend showcase of Pan-Pacific entertainment, music, traditions and food from Friday through Sunday. A hoolaulea kicks off events, closing Kalakaua Avenue for a street party featuring live entertainment, craft booths and an outdoor international marketplace of ethnic food. "Na Hana No'eau o Ka Pakipika/Artistic Endeavors of the Pacific" at Kapiolani Park is a joint event, with the King Kamehameha Celebration showcasing a mix of cultural Japanese and Hawaii food, crafts and entertainment. The Pan-Pacific Matsuri Parade in Waikiki ends the festival, with performers, taiko drummers, dancers and colorful floats. Weekend festivities will also include a performing arts showcase of cultural demonstrations from the Pan-Pacific region, a hula festival, a ground golf exhibition and evening ballroom dancing. Visit pan-pacific-festival.com detailed schedules or to volunteer. Most events are free. Pan-Pacific Hoolaulea: Block party with entertainers from Japan and Hawaii on five stages, street performers, ethnic food booths and more, on Kalakaua Avenue from 7 to 10 p.m. Performing Arts Showcase: Traditional cultural performing arts such as Taiko drummers, Minyo shows and hula performance. » Ala Moana Shopping Center, Center Stage: 11 a.m. to 3:30 p.m. featuring "Furusato" stage. » Royal Hawaiian Shopping Center, Center Stage, next to the Cheesecake Factory, 1 to 3 p.m. featuring "Waikiki Deai no Hiroba." 6th Annual Pan-Pacific Hula Festival: Featuring hula performers from Japan along with local hula halaus, noon to 3 p.m. at Ala Moana Shopping Center, Centerstage. Free. Bionic Kite Festival at Na Hana No'eau o Ka Pakipika: Bionic kite demonstration and exhibition, noon to 2:30 p.m. at Kapiolani Park. Visit biokiteworld.com/main.html for more information. » Ala Moana Shopping Center, Centerstage, 3:30 to 8:30 p.m. featuring "Omatsuri Hiroba." 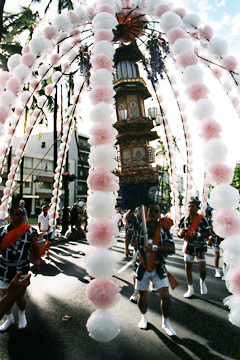 » Royal Hawaiian Shopping Center, Center Stage, 1:30 to 3:30 p.m. featuring a Taiko festival. 6th Annual Hawaiian Half Marathon & 5K Fun Run/5 Mile Walk: Half Marathon with a 5 a.m. start, Magic Island or 5 Mile fun run/walk -- 7 a.m., Kapiolani Park to Diamond Head Road to Kahala Avenue back to Kapiolani Park. Visit pan-pacificfestival.com/marathon.html for more information. » Royal Hawaiian Shopping Center, Center Stage, 1:30 to 3:30 p.m. featuring "Waikiki Deai no Hiroba." » Ala Moana Shopping Center, Center Stage, noon to 3:30 p.m. with a "Pan-Pacific Friendship Stage." Bionic Kite Festival at Na Hana No'eau o Ka Pakipika: Kite demonstrations and exhibition, 12:30 to 3 p.m. at Kapiolani Park. 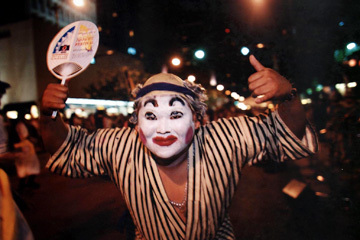 Pan-Pacific Matsuri Parade: grand finale of the Pan-Pacific Festival, 5 to 7 p.m., Fort DeRussy to Kapiolani Park.